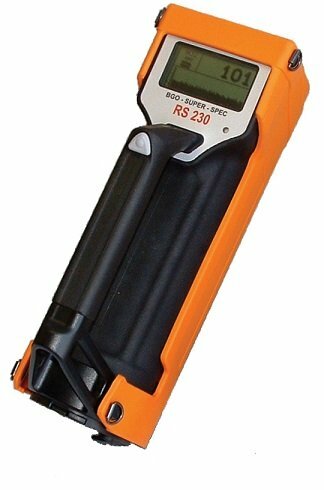 The RS-230 BGO Spectrometer is the industry standard in portable handheld gamma ray survey devices for geophysical applications. It offers an integrated design with a large detector, direct Assay data, data storage, full weather protection, ease of use and the highest sensitivity in the market. Easy to use Bluetooth (BT) Connectivity provides wireless connection to a Bluetooth enabled external GPS receiver, earphone or computer. 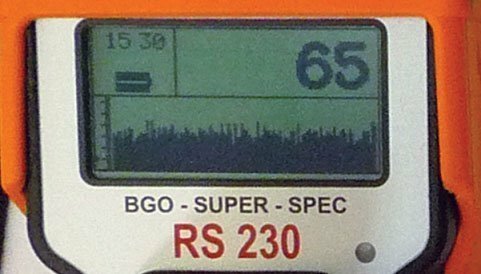 The RS-230 BGO allows the user to produce profiles of the total count data from either the Survey or Assay modes. The data can be from a continuous drill core or from a survey with GPS positioning data. The performance of the 103 cm3 (6.3 in3) higher density Bismuth Germanate (BGO) is approximately 80% of a 390 cm3 (21 in3) Sodium Iodide (NaI) commonly used with larger portable units and approximately 3x more than the same size NaI crystal. The total count readout is typically set at 1x / sec rate, the range is variable from 1 – 20 second integration. When used with a GPS receiver, data can be stored and profiles produced. 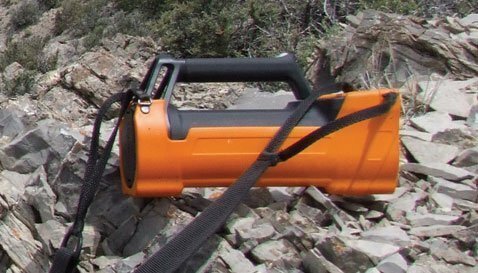 Ideal for both area and drill core scanning. The Assay mode provides the concentrations of K, U and Th. The user can select the desired sample time from 30 to 1800 seconds. The RS-230 BGO comes complete with utility software to download the data that is stored in the memory. All data in memory is output via Bluetooth or USB to the RS-Analyst program on a PC. This may take the form of 1024 channel spectra, data or scan data + GPS. The program also gives graphical and numeric views of the data. The data can also be re-exported as a text file for further processing. • 4MB, memory can be partitioned for desired storage. • More than 250,000 readings or 70 hours of readings. Radiation Solutions Inc. (RSI) is specialized in nuclear instrumentation for the detection, measurement and analysis of low-level ionizing radiation from both naturally occurring and man made sources. RSI’s cutting edge radiation detection technology incorporates a fully digital system design, spectral analysis and advanced data processing. RSI deploys this technology in fixed installed, airborne and mobile systems, portable and handheld spectrometers providing a level of quality previously only attainable in laboratory equipment. RSI is committed to working as closely as possible with customers in all aspects of the product life cycle including product requirement, application, training, support and product enhancement. Our comprehensive approach results in hardware components and industry leading software techniques that produce outstanding results above expectations.